Atlanta actor Mike Schatz plays the character of Emory on Aqua Teen Hunger Force. The Cartoon Network show is currently in the news for a guerrilla ad campaign that wreaked havoc in Boston, and produced one of the greatest press conferences of all time. I tapped Mike for an iChat interview that took eighty times longer than I expected. Brian Sack: You play Emory, one of the characters in Aqua Teen Hunger Force. Are you aware of that? Mike Schatz: Yes, I am. Not ever having seen the show, can you explain the character to me? I play the part of Emory, a Plutonian alien who flies around the universe with another Plutonian who goes by Oglethorpe. Emory looks like a Christmas tree, wears a sweatband and oozes soap. According to the New York Post, the Aqua Teen Hunger Force is “geared toward the Doritos-munching insomniac stoner crowd.” Is that pretty much who you imagine is listening to you when you’re acting in front of the microphone? Well, that pretty much is what I am when I’m acting in front of a microphone, so no comment. Have you ever worried that you were an unwitting pawn in a terrorist organization? If you saw a Lite Brite giving you the finger, would you assume Al Qaeda was involved? It was my understanding that shortly after the 9/11 attacks, that the government brought in Hollywood writers to conjure up some of the worst case terrorist scenarios. I don’t think any of them could have seen this coming though. Apparently the campaign had been underway for weeks in several cities, but no one noticed until recently. What do you think that says about our state of readiness, some five years after 9/11? Are other cities “less ready” or is Boston “more ready”? It is the home of the Minute Men. Are you implying it takes them a minute to ascertain the situation and respond accordingly? Well, in this case it took three weeks to notice and three commercial breaks on Fox to actually retrieve the device and blow it up on national television. In New York, the MTA has a mass transit security campaign called “If You See Something, Say Something.” Do you think spotting guerrilla marketing endeavors is what they had in mind? I think if you don’t see wires hanging out of the lite brite, then things would have been fine. I think wires freaked people out long before Al Qaeda did. Initial criticisms of the PATRIOT Act were that it wiped its bum with the Constitution. In light of recent events, do you now think it should be expanded to cover all aspects of promotional campaigns and marketing to keep America safe? Boston police did what they were supposed to do in that situation, which was to protect the public. If eliminating advertising was in the best interest of public safety, well, it should come as no surprise that Attorney General Gonzales is on the board of directors for TiVo. Do you think this whole event has anything to do with Boston wanting to be higher profile in the hopes that The Departed wins an Oscar? 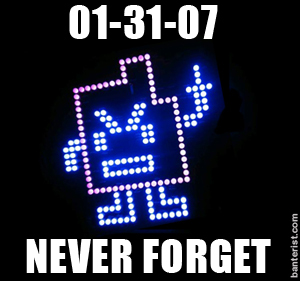 So you’re saying that Boston was using Aqua Teen Hunger Force? That’s where I was headed. Either that or Mitt Romney wants attention. Moving on: I have had to deal with Massachusetts State Police on several occasions – once when I was ticketed for “kissing passenger” and another time when I was arrested for not paying the “kissing passenger” ticket. I personally think the long-haired hippie guy who got nabbed should be terrified. Can you pass on my fears to him? I originally thought an iChat interview might be a good way to generate quality material in a short amount of time, allowing me to go back to the book I’m supposed to be writing. Your overall typing speed has made me completely reevaluate that belief. Are you in the middle of building a shed? [Tremendous pause] I’m not that connected. Nor should my views reflect the views of Aqua Teen Hunger Force, Adult Swim, The Cartoon Network, Turner Broadcasting, AOL Time Warner or Mitt Romney. I think they all feel pretty bad about what happened. I’m slow because I’m at work. I’m originally from Boston, but I live in New York. Do you understand why now? I grew up in Boston. So I can’t understand why you’d live in New York. Seeing that Aqua Teen Hunger Force has a movie coming out, this couldn’t be worse timing to have their show on the front pages of nationwide publications. Right? Right? I think that the coincidence is unfortunate. Aqua Teen has a very strong following, and those people are going to the movie and I hear it’s great. I recorded my part 3 years ago though, so I’m not sure how the John Kerry jokes are going to go over. Hopefully better than John Kerry’s jokes. Moving on: Every bar in Boston asks for ID until you’re about 40. It’s really miserable. Why do they do that? Because one person who looked 40 but was really 18 ruined it for everybody. Lastly: If you could say one thing to the good, often loud citizens of Beantown, what would it be? You don’t need Todd Helton.